Easily plan & optimise the most efficient delivery routes for drivers. Manually planning and optimising your delivery and collection routes can be a real headache – and can be very inefficient. Stream Go uses map-based planning to intelligently optimise delivery routes, improve efficiency, reduce mileage and streamline your logistics operation. At the touch of a button, Stream Go enables you to plan delivery and collection routes which take into account all locations, total route times and vehicle capabilities (such as capacity, weight, cube etc. ), to quickly make the most of your resources. You are able to sort unplanned orders, to add orders with the highest service level or the bulkiest items into the delivery route first. The planning screen only shows the driver and vehicle assigned to the current run, hiding the full list until they need to be assigned. Additionally, an icon shows when multiple orders are to be delivered to the same location. We can even take electric vans and delivery vehicles into account. Stream Go is not a ‘batch’ engine solution that produces a ‘one-off’ best plan, which you have to either accept it, or leave it. By applying intelligence and using sophisticated route optimisation algorithms, Stream Go produces the most economical delivery (and collection) routes for your vehicles. Stream Go then enables you to use the experience and knowledge of your transport or logistics planner by providing the maximum amount of information in the most intuitive graphical manner. The route optimisation process is iterative, allowing additions and fine-tuning right up until the time the vehicle leaves (and later in terms of collections). Your customers and partners can also track and view the progress of their own deliveries using the customer gateway, meaning that they always know where their order is. Stream Go makes it quick and easy to manage orders and delivery / collection runs with multi-select processing. Benefits are two-fold. You get greater planning flexibility, while at the same time, you can perform task more efficiently and effectively. Scenarios where multi-select planning can be used are numerous, but here’s just a couple to illustrate. 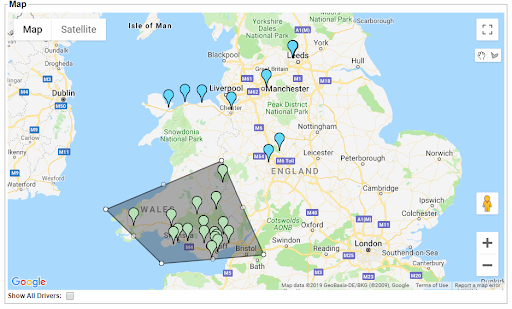 If you need to quickly plan a group of orders, you can simply select those unplanned orders, select ‘Load’ to add them to a run and then optimise that particular route. If you need to print or email proof of delivery PDFs from a number of orders, you can select those orders and then select the ‘Action’ button to quickly print or email. Multi-select also makes is easy to plan overnight stops in multi-day runs and optimise drops and / or collections for each day independently. Stream’s area drawing tool enables you to quickly and easily select orders straight from the map in advanced planning. You can use the tool to draw multiple areas, or simply select orders in a single area.